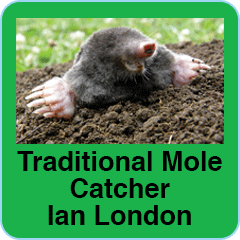 My name is Ian London and I am a LANTRA trained and highly experienced molecatcher. I am a member of the Association of Professional Mole Catchers (APMC) and offer a no catch no fee service. I specialise in domestic work, including smallholdings of up to about 20 acres. I am fully insured and use traditional traps, rather than any gas or poison. And, because the traps are placed in the underground tunnels, there is generally no risk to household pets. I only use top quality traps, in order to ensure the unwanted mole is dealt with as quickly and humanely as possible. All traps are checked regularly, generally on a daily basis, and I aim to be able to deal with your problem within 48 hours of initial contact. And remember – if I don’t catch it you don’t pay!